Something exciting is afoot. After 18 months of treading water, trying to come to grips with how to read Lenormand, I finally experienced my big lightbulb moment! In that moment of clarity everything I had learnt about Lenormand suddenly slotted perfectly into place. I am so excited to share what I have learnt that I started a study group on Facebook called Lenormand Toolbox. If you’re still treading water on your Lennie journey, or if you’re totally new to Lenormand and would like to learn more about it, or even if you’re an ‘old hand’ at it; come join me and a great community of other like-minded Lenormand enthusiasts where you can learn to read Lenormand in 5 EASY STEPS. Absolutely free of charge! I know what it’s like to stumble and fall, over and over again while trying to learn this fascinating system of European fortune telling. Therefore, if I can share even one little thing with you to make your learning experience easier or less frustrating, I’d happily do it. For this awakening I credit Mary K. Greer, she was the right teacher at the right time for me. 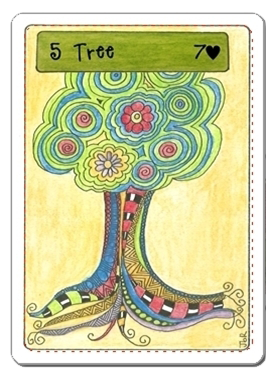 I had enrolled and participated in many Lenormand courses before signing up for her fabulous Le Petit Lenormand Course. All of them were good, yet it was in Mary’s class that the penny finally dropped for me, and now I want to share my insights! 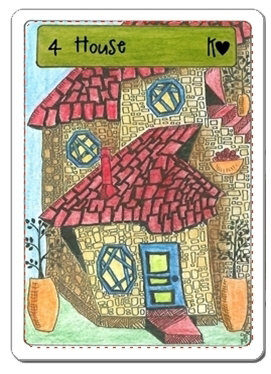 If you would like to learn to read your own cards, or if you’d like to add Lenormand readings as an extra service to your existing tarot practice, hop on over to the Lenormand Toolbox. Looking forward to seeing you there! 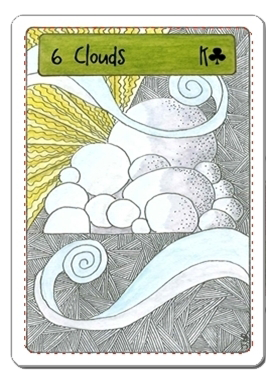 In today’s post I create combinations with the Clouds card. We know that House means: Home, Family, Security, Possessions, Comfort, Property, Real estate, Small building. What happens when we combine it with each of the other 35 cards in the deck? 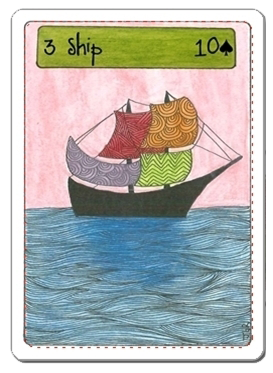 The Ship card often refers to travel (amongst other things.) In this list of combinations I had fun listing various travel scenarios to add to my directory of card combinations. 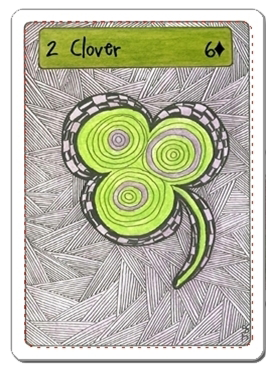 Clover + Key = Winning Lotto numbers, Double confirmation: Yes! Yes! These are my interpretations. I’d welcome discussions, questions & suggestions as well as your own combinations (in the comments section.) The best ones will be added. Ideally this series will become a valuable resource for learners of Lenormand; if anything your input & experience would contribute additional value to this growing list. Sidenote: Rider is the ‘main’ card in these examples, therefore the other added cards will modify the Rider (rather than the other way around.) That is to say, the focus will be on the Rider card which will be influenced by the card used in combination with it. As you can see, these are only a few of many possible combinations. I look forward to seeing the combinations that you come up with; remember to post them in a comment so that we can all learn from and with one another. 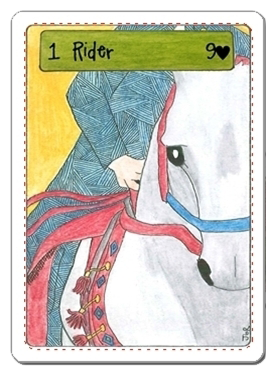 When I started learning Lenormand the first thing I was taught was that I would need to decide on the keywords (card meanings) for each of the 36 cards in the deck. As someone relatively new to this journey I have settled on a few basic keywords from which I can begin. Follow my adventures as I journal about the process of learning Lenormand. A system of fortune-telling that has confused me for long enough. 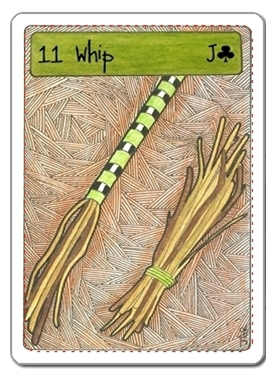 I am determined to consolidate what I have learnt and to push the boundaries further in this new series on Tarot Taxi, JbR’s Lenormand Journal. Let’s learn together, I welcome your comments, questions and experience.